I am considering getting my first AP and need some help understanding the references better. 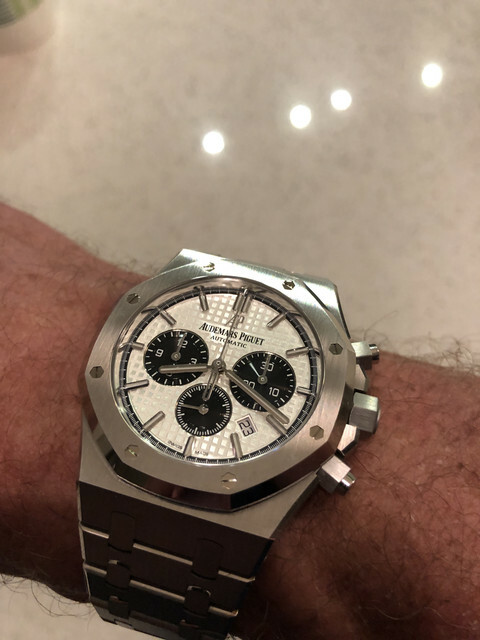 I tried on the 41mm chrono over the weekend and loved it. I like chrono dials and the version I tried was the panda silver and black reference. 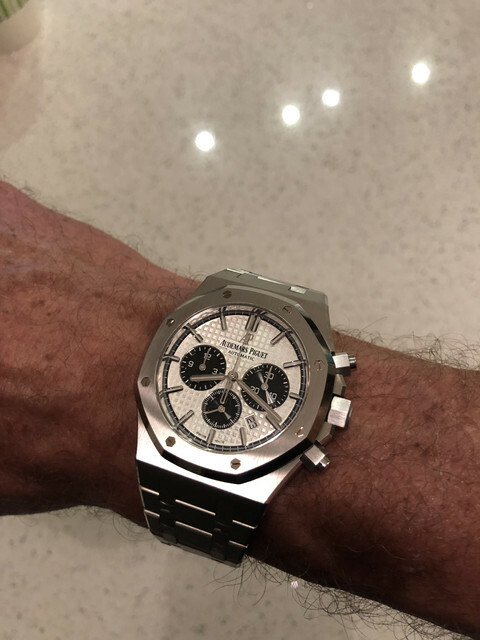 I also have a Polar Exp 2 and the ROC felt similar and while the overall heft of the watch seems more on the AP, the dial of the Exp2 looked much larger (the inner black minute train on the AP contributing to this too). I am also keen on the new 38mm ROC but when I tried the 37mm grey 15450, it felt quite small. I imagine the 38mm ROC with the minute train will make the dial look a bit cramped. From web pics it doesnt seem so but photos online always look larger IMO. They also had a 37mm chrono on display and it def looked small. Lastly, I am also considering the new 41mm in slate grey. I like how classy it looks but do find the dial a bit plain and worry if I will tire of it over time. So for those experienced on AP, which of these would you recommend as a first AP? If the 15450 seemed too small I would prob forget the 38mm chrono. Between the panda ROC and the 15500 slate I would prefer the 15500. Display case, new movement and its just a new release which makes it more fun for a first royal oak. Given that the wear of 37mm looked small to you, I’m guessing you’d feel the same with 38mm chrono which also shares the same bracelet as 15450, and is only thicker in case. Between ROC and slate grey, if your options are silver panda and slate grey 155, I’d recommend slate grey. But if your options are blue ROC and slate 154; I’d go with blue chrono. Out of those 3 options, I would recommend the 15500 grey dial but I am not sure if you can secure one. I believe the bracelet on the 38 mm chrono is identical to that if the 15450, so if you felt it wore small, you’d probably feel the same of that chrono. 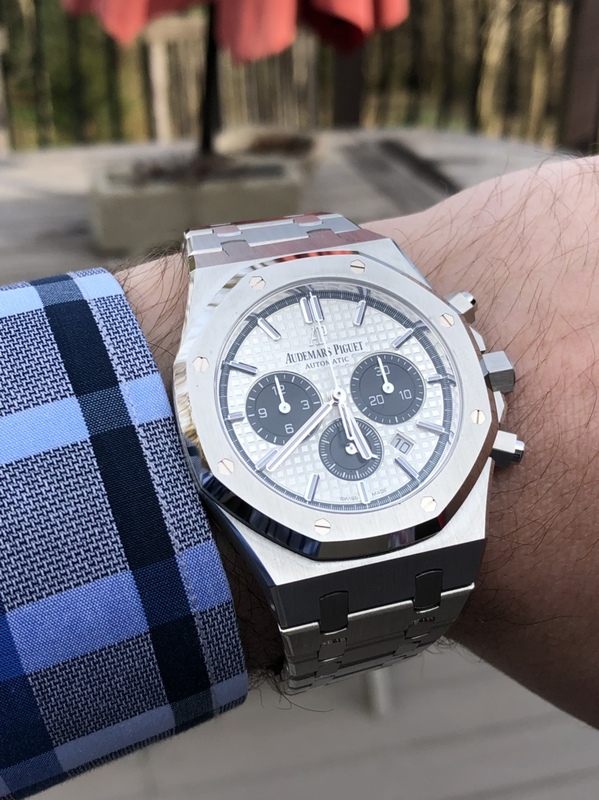 The silver panda chrono is stunning but assume the same of the grey 15500. Go with your gut, but I’d probably stick to one of the 41 mm options. You might try to locate a 39mm RO chrono ref. 26300. Tough one, think 39mm is probably your best size, shame the new one didn't come out. Yup that’s the one. I also tried the black dial and saw the blue dial in the metal (couldn’t try it as it was spoken for already) and just felt the silver was the most stunning, followed by the blue. The boutique said all their ROC 38s are taken up already for 2019, but if I want the silver or grey ones, Feb 2020 is almost sure. I’m in no rush so maybe when the 38s come in in Q4 19 then I have a look at it first. They said the 41ROC is not a challenge to get in 1-2 months so long as it not too close to year end. Same for the 155. In fact they said if I want one by Q4 19, they can still get me a slate or black. I am tempted by the notion of going for the “classic” look first as a first foray into the brand, but I feel I would go for it more due to it being true to the model’s historical roots (which for me is not bad rationale) than the look per se. don’t get me wrong, looks great, but the chrono just edges it a bit I feel. Maybe if it were the blue dial I would feel differently. One thing I have to say is so refreshing with AP is that there’s no games or crazy lists. Tell them what you want and they’re transparent with what and when. I haven’t seen a 38mm ROC but from the pictures my gut says it’s going to be too darn small. I’ve owned a 15400 and I now own a white ROC. 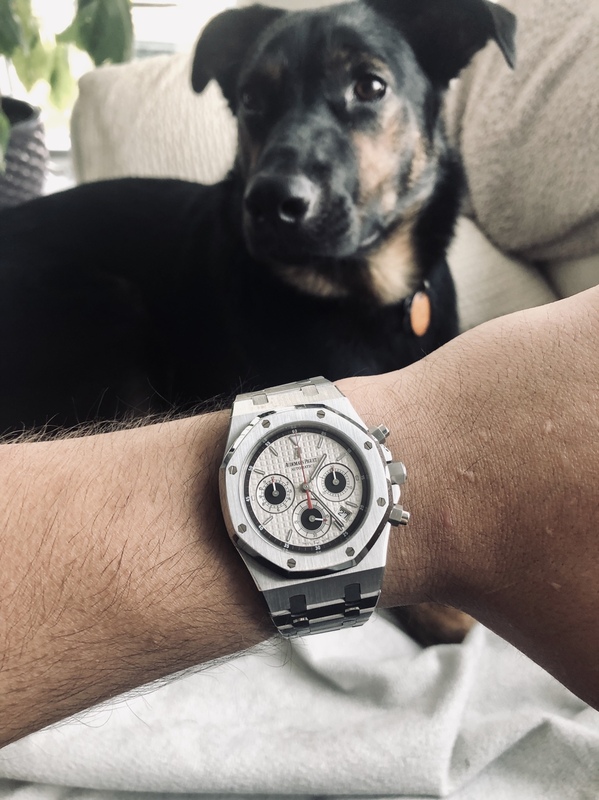 I wasn’t thrilled with the 15400 for a handful of reasons but the 41mm ROC checks all the boxes for me that the 15400 didn’t. Although it’s on the far side of the spectrum for size I think it really works. Super sporty but all class. I have a 7 inch wrist and found the 38 to be my size. All ROCs wear about 2-3 mm large so it fits just right. The 41 looked too large. This is how 41mm would wear on smaller 6.5” wrist. I personally prefer 41mm for my wrist, over 37mm. But I agree with comment above, 39mm is the sweet spot.